Despite its name, Bachelor's Grove Cemetery, located off Midlothian Turnpike in the southwest Chicago suburb of Midlothian, is not the eternal resting place of unmarried men. This cemetery, one of the first in the Chicago area, was most likely named for the Batchelder family, but misspelled over the years. The Batchelders were German immigrants who settled in the region in the early nineteenth century. The cemetery lies on the edge of the Rubio Woods Preserve and is not easy to find. Still, considering the fact that Bachelor's Grove Cemetery is one of the most haunted locations in the Chicago area, with more than one hundred paranormal events attributed to it, the cemetery is well worth the hunt. My wife, Mary, and I made a visit to Bachelor's Grove on a warm day in August, armed with directions given to us by Dale Kaczmarek, noted Chicago psychic investigator. We easily found the Rubio Woods Preserve parking lot on the north side of 143rd Street in Midlothian and parked our car there. Across the street stood two cell towers. To their right, although not visible from our vantage point, would be the road that led into the cemetery. From where we stood in the parking lot, all we could see on the other side of the street were dense woods and tangled, weed underbrush. We crossed the street and walked to the right of the towers. "Is that it?" mary said, pointing to a rusting chain strung between the concrete posts and so overgrown with brambles and creepers as to be nearly invisible. We could see a narrow gravel road just beyond it. There was no sign indicating the cemetery. "I don't know," I said. "Let's check it out." The road was rutted and littered with pieces of asphalt. We walked down the road, the dark and shadowy woods rising up on either side of us, closing over us at times like a tunnel. Narrow trails, made by animals--or perhaps, other creatures--snaked off into the murky depths of the forest. We were not that far from 143rd Street, but in the leafy confines of the forest, sounds from the outside world were lost to us. All we could hear were the scuffing of our feet on the gravel, the sign of the wind streaming down the road, and the sudden scurrying of unknown things in the woods startled by our passing. About a quarter of a mile down the road, which had narrowed even more, we came to a high chain-link fence in poor condition. A wide gap in the fence allowed us to enter the cemetery. Bachelor's Grove was like no other cemetery we had visited in the Chicago area. It was completely overgrown with weeds and tall grass. Beer cans and other debris littered the ground. Old trees dangled broken branches, while fallen limbs lay among the stones. The grave markers that had not yet been stolen or completely destroyed by vandals were broken and scattered, some half buried beneath the weeds, others desecrated with spray-painted graffiti. One huge tree felled by a storm had crashed down into the cemetery, flattening a long section of the fence beneath it. A large pond bordered one side of th cemetery, its surface completely skimmed over with pea-green algae. I would not have buried my worst enemy in such a place. It had been at least fifty years since the last burial in Bachelor's Grove and, as time passed on, so did those who cared for the cemetery. It is an orphan now, it seems, completely abandoned by the world. Could it be that such isolation and desolation, such utter negligence by the living, have created conditions that foster a psychic environment in the cemetery that attracts ghosts? Do ghosts roam Bachelor's Grove simply because they can do so without much interference from the living? We walked through the cemetery. Some sections of a dirt path still remained winding among the graves. Other man-made trails pushed through the weeds and grass. mary sat in the sun on the base of a monument whose stone had disappeared while I continued exploring, taking photos as I walked. I came across a small square stone engraved simply, Infant Daughter. It stood back against a much larger tombstone with the name Fulton carved upon it, but I had no idea if the two were related. So many of the stones had been moved around by vandals that it was difficult to know if this little marker actually stood above the remains of an infant girl or whether she was buried somewhere else on the grounds. Still, other visitors had commemorated the little girl's death and had left tokens of affection: a few plastic roses, a faded bead bracelet, little stuffed toys--a black cat, red teddy bear, orange teddy bear, all coming apart after being exposed to the elements. A miniature Laa-Laa of Teletubbies fame rested on top of the stone. It was an incredibly sad scene. Riley Elizabeth, my first granddaughter, had been born only two months before we visited Bachelor's Grove, so it may be that I was overly sensitive at the time, but it seemed to me almost a criminal offense that the poor little nameless girl would spend eternity in a place as forlorn as that cemetery. The thought then struck me that perhaps it was my own psychic emanations, as well as those of other visitors who were equally affected by the hopelessness and depressive nature of the cemetery, that were creating the ghosts. This was not to say that the ghosts were all "in our heads," but that maybe we were creating the psychic fuel, the energy, that ghosts needed to become manifest. This theory may help to explain the variety of ghosts seen at bachelor's Grove. I walked back to where mary was sitting and told her my theory. "Could be," she said. She looked down at the rusting bud light cans lying in the weeds. "Or maybe it's just the beer," she said. She is such a skeptic. 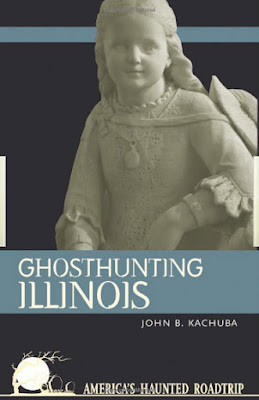 One of the more common ghosts seen at Bachelor's Grove is that of a lady in a flowing white gown. Some have nicknamed her the "Madonna of Bachelor's Grove." She has been seen on moonlit nights walking the cemetery grounds, a baby wrapped in her arms. Is she the mother of "Infant Daughter?" At least two photos taken in the cemetery, both in broad daylight, have yielded the image of a lady in a white gown, even though she was not visible at the time the photos were taken, but appeared only as they were developed. One of them, taken by Mari Huff, who was visiting the cemetery with members of the Ghost Research Society, shows a semitransparent, dark-haired young woman in a white gown sitting serenely on the remains of a tombstone. her hands lie in her lap, her feet positioned slightly forward, and her eyes are cast downward as though she is contemplating a spot just before her. When she later saw that photo in a book, Mary reminded me that she had been sitting in exactly that same spot, apparently sitting on the ghost's lap. The second photo shows a dark-haired young woman in a white gown just emerging from behind a tree in a wild, thickly forested part of the cemetery. She appears to be more solid than the seated woman and her gaze is turned directly toward the camera. Neither woman carries an infant. There are other strange ghost stories associated with the cemetery. Dale Kaczmarek tells the story of the ghost farmer in his book, Windy City Ghosts. According to Kaczmarek, in the late 1970s, two Cook COunty Forest Preserve Rangers who were on night patrol in Rubio Woods had an encounter that defied all logic. As they were approaching the pond near the cemetery, a farmer walking behind a horse-drawn plow suddenly appeared in their car's headlights. The driver of the car hit the brakes. The rangers watched in amazement as the farmer crossed the road and quickly disappeared into the darkness of the woods. Kaczmarek's research into the event revealed that a farmer had drowned in the pond nearly a century before when the horse that was pulling his plow suddenly spooked and bolted into the pond. The farmer became entangled in the traces, was pulled into the pond with the horse, and drowned. The scummy pond may have its own haunted history, as well. Unsubstantiated reports say that the pond was a frequent dumping place for victims of Chicago's gangland wars in the 1920s. Mary and I had been in the cemetery only a little while when we noticed that we were not alone. A man was standing beside one of the tombstones. It seems he appeared out of nowhere; we hadn't seen him come in, nor had we noticed him right away. He was probably in his thirties, thin, with a pale complexion and spiky blond hair. He stood quietly by the stone, studying it. Mary nudged me. "Why don't you go over and talk with him?" she said. "See what he's doing here. Maybe he has a story for you." This is why Mary travels with me. She feels it is her duty to prod me past my customary introverted nature, to get me to talk to strangers. I hate when she does that, especially when her prodding--a less generous husband would call it nagging--pays off. So, I talked with him. Greg* said that he had lived in the area all his life but had never come to the cemetery. When a friend of his who lived across town asked Greg when he knew about haunted Bachelor's Grove, Greg was embarrassed to say he knew nothing. he thought it was about time he changed that situation. He was not a believer in ghosts, Greg said, although he did believe in spirits as they pertained to his Christian faith. We stood for some time on a narrow trail in the tall grass, talking about various theories of the afterlife. I told him about the book I was writing and he seemed interested. All the while that we stood talking, however. I had the odd feeling that he was at the cemetery for some reason other than idle curiosity. he must have been there before we arrived, and he remained all the while we were there. Bachelor's Grove is not a large cemetery; certainly he must have seen it all long before we did. What was it he was seeking? We went our separate ways. Every so often I would look up and find him somewhere among the weeds, gazing at the tombstones, as if he were seeing something among them that I could not see. I concentrated on my own exploration and found myself walking down a straight dirt path through the weeds. Trees stood along the sides and broken grave markers lay partially hidden in the bushes. As I walked down the path, I noticed that there was a single gravestone at the very end, a low rectangular stone only a few feet before the chain-link fence. I rad the inscription on the stone and immediately called Mary. She came down the path and joined me. "Look," I said, pointing to the stone. The name Newman was carved in large letters across the face of the stone. For professional reasons, mary uses her former surname rather than mine. that name is Newman. Two other names were carved upon the stone in smaller letters, Daniel and Dora, husband and wife. I would have been shaken, had I discovered my name carved on a tombstone, especially in a cemetery where probably no more than a dozen stones bore any inscription at all, but mary seemed unperturbed. "It's a common name," she said. Well, sure, I thought, but to find it there, in that place, at that time? I didn't know how Mary felt, but I don't like my irony served up in cemeteries. I took a few more photos and then we walked back toward the opening in the fence. As we left the cemetery I looked back and noticed that Greg still lingered among the graves shaded beneath the trees. I turned now and then as we walked back up the road to see if Greg was behind us, but he never appeared. For all I know, he may still be wandering around in Bachelor's Grove Cemetery.